When it comes to form and function, the Little Twin Cub bench by SWIGG does it all. Two doors, made from sustainable bamboo plywood and paper-based fibers, slide open to reveal ample storage space for books, toys, and other kid-related paraphernalia. Topside, a pair of squishy cushions, upholstered with Eco-Intelligent Polyester and stuffed with 85% post-industrial recycled denim fill, provide a comfy spot for story hour or putting on shoes. The best part? Because the Little Twin Cub is so sleekly designed, and doesn’t scream “for kids,” it can graduate from the nursery to any part of your home without looking out of place. When it comes to form and function, the Little Twin Cub bench by SWIGG does it all. 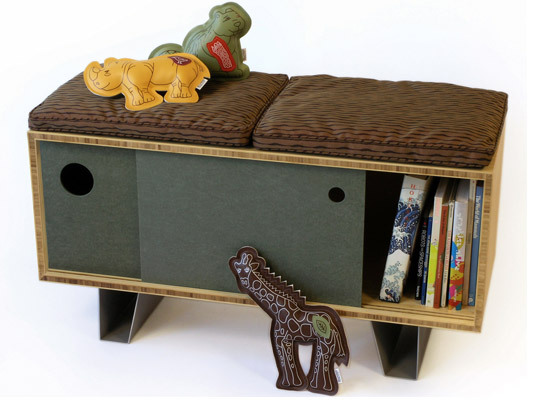 Two doors, made from sustainable bamboo plywood and paper-based fibers, slide open to reveal ample storage space for books, toys, and other kid-related paraphernalia. Topside, a pair of squishy cushions, upholstered with Eco-Intelligent Polyester and stuffed with 85% post-industrial recycled denim fill, provide a comfy spot for story hour or putting on shoes. The best part? Because the Little Twin Cub is so sleekly designed, and doesn't scream "for kids," it can graduate from the nursery to any part of your home without looking out of place.